Due to the creative conflicts during production of “Signals”, Rush politely made it clear to Terry Brown that they wished to move on and work with other producers. After interviewing several candidates, Rush settled on Steve Lillywhite, only to have him back out to work with Simple Minds at the last possible second. Scrambling to find a replacement while pre-production and songwriting were still going on, the band eventually settled on Peter Henderson, best known for his work with Supertramp at the time. Henderson, however, was better skilled at engineering than he was producing, and had a hard time helping the band choose and develop material. Recording ended up taking six whole months with few to no breaks and fourteen hour days, the longest production for a Rush album up until that point. Perhaps that would explain the overall dark and dire tone of the album. Some people point to “Roll The Bones” as Rush’s darkest album lyrically, or “Power Windows” for overall cold production. But “Roll The Bones” had bright (almost poppy) composition and production to offset the darkness, and “Power Windows” had dynamic performances to offset the coolness. “Grace Under Pressure” doesn’t have either of those. The performances and production are sparse, cold, and create a feeling of dread and impending doom. Lyrical subjects include (in order) nuclear war, loss of a loved one, the holocaust, fear, dehumanization, fighting for your life, mutually assured destruction, and how life in general tries to beat you down and crush you. This was Rush on its own for the first time, and they were finding the world to be a scary place indeed. The album starts with static that quickly tunes in and comes into focus with “Distant Early Warning”, the first single and the most enduring track from the album. It quickly sets the harrowing tone for the record, putting into music the fears people had at the time of nuclear annihilation. This album, perhaps more than any other, are where Geddy’s keyboards are most dominant, chiming with the bells of doom throughout the song. “The world weighs on my shoulders/But what am I to do?” he asks. That seems to be the eternal question on this album. “Afterimage”, despite being a song about death and loss, has a much quicker pace. Even with keyboards, it has an almost punk rock pace during the verses, and a heavy metal pound during the choruses. 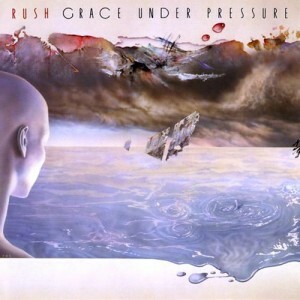 Make no mistake; despite the emphasis on keyboards and Alex’s bright guitar, “Grace Under Pressure” is a heavy album. Live remixes in recent years have added more distortion into the mix to show this, and it makes some of the tracks more epic and intense than they were before. This is best shown by “Red Sector A”, perhaps Rush’s most harrowing song of all time. While the lyrics were written by Neil (as usual), it was heavily inspired by Geddy Lee’s parents, who were both Holocaust survivors, and the band holds nothing back with the lyrics. “Skeletons, they shuffle away/Shouting guards and smoking guns/Will cut down the unlucky ones“. After “Distant Early Warning”, this would probably be the most enduring track by the band, and would make for emotional moments during live performances (especially with the equally harrowing rear projected images). Rush ups their reggae influences again on “The Enemy Within”, the last installment of the “Fear” trilogy (at least until “Vapor Trails”). After the previous installments talking about mass fear and how it can be a weapon to be used against you, this song goes right to the source: fear comes from within, and in the end we must curb it or miss out on life’s adventures and opportunities. “Revolution or just resistance/Is it living, or just existence?” indeed. “The Body Electric” belongs to Neil, Alex’s spartan guitar and Geddy’s springy bass line giving plenty of room for his unique beat. The song describes its premise right in the second line “An android on the run”. Musically it’s very tight and percussive, and Alex gets one of his better solos on the album in. Lyrically, it continues my problem where I like Rush’s sci-fi themed songs, where they attach a metaphor to the proceedings. When they do straight sci-fi songs (like “Chemistry” on the previous album), they tend to lose me, and the chants of “One zero zero one zero zero one” during the chorus just sound cheesy to me, which is a shame because otherwise the song is very good. “Kid Gloves” is easily the brightest song on the album, in terms of both composition and lyrics. The keyboards take on a more textural role on this song, with Alex’s arpeggiated guitar line taking center stage. Lyrically, it speaks of youth growing older and overcoming the harshness of the outside world. Considering the band’s previous songs championing wayward youth and standing up for yourself in a controlling world, it’s the one song that has the most in common with “Signals” and “Moving Pictures”, and it’s a breath of fresh air compared to the darker songs that surround it. An underrated gem to be sure. “Red Lenses”, dare I say it, is Rush’s first attempt at funk. It’s an extremely clumsy attempt though, and their attempts at “funkiness” wouldn’t be perfected until “Presto” or “Roll The Bones”. The lyrics especially are really weak, and though they’re credited to Neil they feel as if Geddy Lee is making them up off the top of his head. Even the composition or performances aren’t especially tight, feeling like the band is trying to find direction through the whole song. Neil gets a good marimba solo in the bridge, but that’s about the only unique part. Easily the weakest song. Geddy’s keyboards take precedent on “Between The Wheels” almost immediately, but Alex’s guitar isn’t left out this time, sounding the heaviest they have all album with his chording echoing, bending, and feeding back the whole time. The keyboards hold the tight rhythm while Alex goes wild in the periphery, before leading to his blistering solo. The lyrics arguably bring the whole album’s theme into focus: the wheels of the world (be they war, fear, or oppression) will try to bring us down no matter what, and it’s up to us to fight back. Recently performances on the “30th Anniversary Tour” and the “Snakes & Arrows Tour” show how intense this song can really be with the updated tone, and it’s perhaps my personal favorite song on the album. I applaud Rush for taking a risk with the dark emotional intensity on this record, something they hadn’t really done before now (at least not to this extent). It couldn’t have been easy since this was their first album on their own and their “producer” wasn’t much help. But the darkness is part of the reason why, as a whole, I don’t listen to the album very much aside from the odd individual track. The cold production and straight-up weaker material in some places don’t help either.